The University of New Brunswick (UNB) is launching a new sustainability program on its Fredericton campus this week. 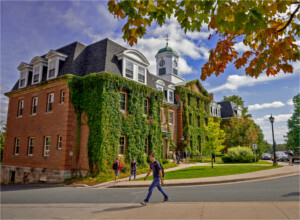 The program will support and encourage environmental sustainability on campus, helping to build a better university and advance UNB as a sustainability leader. Several local environmental groups will join UNB Sustainability Celebration: Be the Change! on Wednesday, Oct. 1 from 12-1 p.m. in the SUB Quad to showcase environmental and sustainability initiatives that are happening in the community. Mike Humble from Harvest Jazz and Blues Galaxie Rising Start winners, Earthbound Trio, will be joining us to play an acoustic set. UNB’s Sustainability Program has several great initiatives planned for 2014-15. One Million Acts of Green is a tool for UNB students, faculty, staff and alumni to keep track of their sustainable practices, report progress, see the impact of their sustainable commitments and measure their carbon footprint reduction. There are more than 100 sustainability actions to choose from. Participants may select eco-friendly actions they do at home and on campus. Each month will feature a sustainability theme with engaging activities. October is food month and UNB (Fredericton) will be holding a food week from Oct. 6-10 featuring a virtual classroom with David Suzuki and friends, a thanksgiving cooking class featuring local foods, and a speaker series with a different food related topic each night. Join our celebration and learn about what sustainability initiatives will be going on each month within the campus community this year.